Arms and armour are rarely associated with art. However, they were influenced by the same design sources as other art forms including architecture, sculpture, goldsmiths' work, stained glass and ceramics. These sources had to be adapted to awkward shaped devices required to perform complicated technical functions. This pari of pistols is one of the finest in the Museum's collection. They are decorated with inlaid antler. 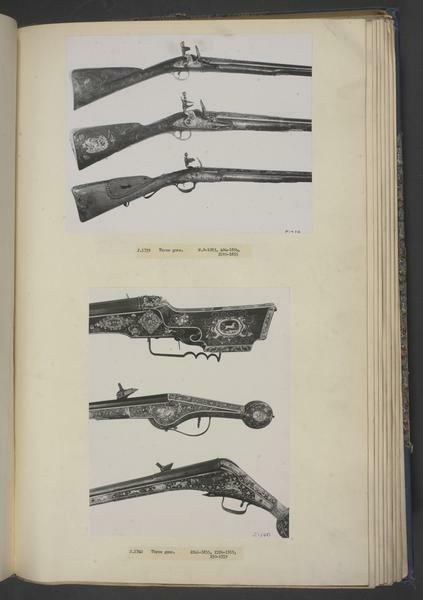 Such weapons were collected as works of art as much as hunting or warfare. 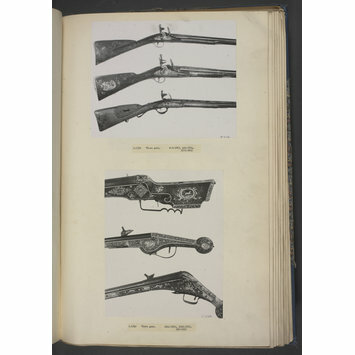 The gun is fitted with a wheel-lock, a mechanism that enabled it to be carried loaded. The jaws of the lock clamped a piece of flint or a piece or pyrites designed to rub against the rough edge of the wheel projecting into the pan. The wheel was revolved at speed by a tightly coiled spring, wound by a separate spanner, and released when the gun's trigger was pulled causing sparks to ignite the gunpowder in the breech. Sketches for wheel-locks were made by Leonardo da Vinci but their first common use was in Germany in around 1520 and they continued in use until the late seventeenth century. They were the first devices to fire guns mechanically and accelerated the development of firearms by negating the need for long and dangerous 'match' cords which had to be kept dry. As technical devices wheel-locks attracted princely collectors. Many are finely chiselled and engraved as works of art, some even on their insides, to be taken apart and reassembled at pleasure. The stocks were also often decorated with fine bone and horn inlays drawing on the skills of furniture makers and engravers. 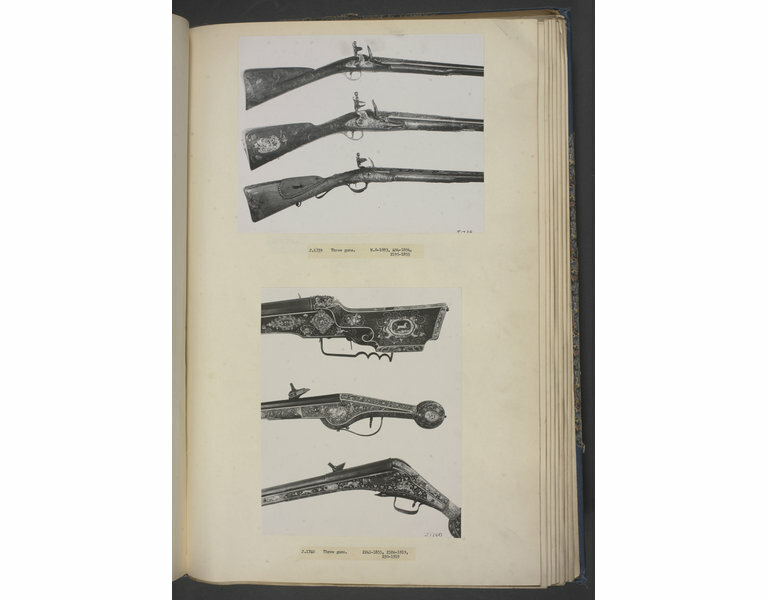 Wheel-lock guns were expensive, however, and most ordinary gunners were equipped with the older style match-locks until well into the seventeenth century. A pair of wheel-lock holster pistols with walnut stocks profusely inlaid with oval plaques engraved with allegorical figures within elaborate scroll-work and enclosing minute human figures, animals and birds, of stag-horn and ivory. The inlaid ornament appears to be derived from designs by Theodor de Bry, Adriaen Collaert and Jost Amman. The locks are of early 17th century type, and are unsigned. The barrels are octagonal, the blueing has been renewed. They are stamped at the breech with a barrel-smith's mark which has been partly obliterated through cleaning. There is no feature in the mechanism or ornament which would justify an attribution to any particular locality within the German cultural area. Pair of wheel-lock holster pistols, with engraved staghorn decoration, German, 1600-1610. Patterson, Angus, Fashion and Armour in Renaissance Europe: Proud Lookes and Brave Attire, V&A Publishing, London, 2009, ISBN 9781851775811, p. 89 ill.